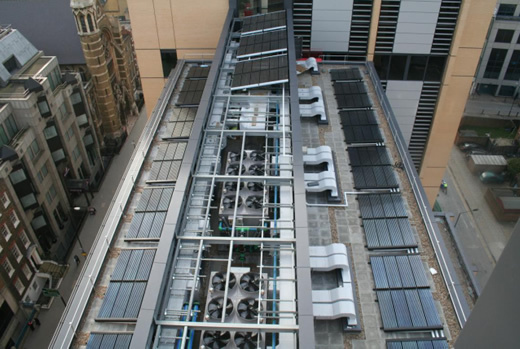 Global Grange Ltd are completing their new 5 star hotel in the heart of central London and have incorporated solar technology in the design to great effect. Working alongside ‘ D e2 ’ ( d esign and engineering consultants ) , SolarUK Ltd have designed, supplied and installed, a 140 collector LaZer2 solar thermal system, which will provide solar heated water for the hotel guests and will aid in reducing the carbon footprint of the building. The finished building will also benefit from a 49.4kWp photovoltaic electricity generating system, and will boast some of the most sustainable and energy-saving features anywhere in the city. This system heats around 7200-Ltrs water each day for showering, washing hands and cleaning. It is a prime example of how solar thermal technology can be used to great effect on virtually any scale provided careful consideration is applied to its integration with the existing building services. At Solar UK we are unique in that we provide solar solutions, working with the customer to turn their solar gain into Energy. With unparalleled experience in both domestic and large scale installations, Solar UK has the expertise to tackle your Renewable energy demands.